Girl of Nightmares (Anna #2) by Kendare Blake. Audience/Genre : Young Adult/Horror, Paranormal. Publication : August 7th 2012 by Tor Teen. I thought the cover of Anna Dressed in Blood was creepy but after looking at this one, I can't decide if it's scary or beautiful..or both. It's so magnetic, I swear I can't take my eyes off it. Anna Dressed in Blood was one of my favorite young adult reads last year. As soon as the release date was announced for Girl Of Nightmares, I knew I had to get my hands on it as soon as possible. 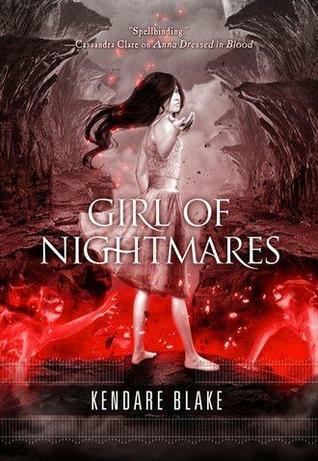 Girl of Nightmares picks up a few months after Anna Dressed in Blood. Cas and his friends, Thomas and Carmel, are trying to move on with their lives after what happened with Anna and the Obeahman but to Cas, that pretty much seems impossible. He can't get Anna out of his head; he sees her everywhere, hears her when he's on hunts and everything leads him to believe that she's trying to send him a message. Cas needs closure and since he has no idea what happened to Anna, he needs to know she's fine and is willing to help her no matter what it takes. This book has a different tone/vibe from Anna; while Anna Dressed In Blood was basically a trip down spook-ville, Girl Of Nightmares is all about answers. Don't get me wrong, although this one wasn't as frightening as Anna, it still gave me goosebumps. You know how you read a book by an author, you love it and you expect the same results from the sequel? Well, Kendare Blake's writing is as mesmerizing as ever, despite the turn in direction. She's one of the few authors who does a terrific job with a male protagonist and point of view. I simply love Cas, throw in Thomas and Carmel, they make an unbeatable team. Just as with Anna, Kendare manages to provide entertainment through a dark novel without compromising on the storyline. Girl Of Nightmares is hands-down one of the best young adult books of 2012; eerie, gripping and all kinds of scary, it will raise the hair at the back of your necks. Trust me, you won't be able to put this book down.